Our Prime Minister had announced a new Pension Scheme for Senior Citizens offering 8% returns for 10 years in December 2016. The proposal was also stated in Budget 2017. This has finally been launched on May 4, 2017 with the name of Pradhan Mantri Vaya Vandana Yojana 2017-18 (PMVVY). In this post we review PMVVY and check if senior citizens should invest into it? It gives return of 8% compounded monthly. So its equivalent of 8.30% annually. The table below gives the minimum/maximum purchase price and the respective pension that one would receive for 10 years. The maximum investment limit was revised in Budget 2018 from Rs 7.5 Lakh to Rs 15 Lakh. You can buy anything in between (including both amounts). The maximum limit above is for one family. Family here means spouse and the dependents. The policy can be surrendered under exceptional circumstances like money required for the treatment of any critical/terminal illness of self or spouse . The Surrender Value payable shall be 98% of Purchase Price. Loan facility is available after completion of 3 policy years. The maximum loan that can be granted shall be 75% of the Purchase Price. The rate of interest to be charged for loan amount would be determined from time to time by LIC. Loan interest will be recovered from pension amount payable under the policy. This is a simple product with a guaranteed return. The scheme is guaranteed by Government of India and is managed by LIC. So it has safety of highest level. As the economy develops the interest rates come down. Hence it’s a good product to lock 8% interest rates for 10 years. However banks too offer fixed deposit tenure for 10 years. The policy can also be surrendered before maturity for treatment of illness. 75% Loan against policy can be a good thing for emergency liquidity needs. The pension you receive is taxable. This would be added to your income and taxed at your marginal tax rate, similar to fixed deposits. The pension is not adjusted to inflation. Assuming inflation at 7%, the purchasing power of Rs 5,000 would reduce to Rs 2,500 in 10 Years. You can buy Pradhan Mantri Vaya Vandana Yojana online through LIC website. There are few investments which still offer more than 8% returns for senior citizens. You must look into the same before committing your funds to Pradhan Mantri Vaya Vandana Yojana. 1. Deutsche Bank (5 years), IDFC Bank (366 days), Lakshmi Vilas Bank (750 days) offers 8.0% for senior citizens fixed deposit. The added advantage is you can withdraw the amount anytime. The problem is the liquidity for these bonds are low and hence it’s difficult to buy/sell. However you can buy easily when they are issued. PFC, HUDCO, NABARD, IRFC etc had issued tax free bonds in the past and are available on exchanges with yields in the range of 6.44%. The bonds have residual maturity of 10 to 15 years. As the interest received is tax free, these turn out to be better investments for senior citizens in highest tax bracket. The interest payout is annual. Also all the companies are backed by Government of India and also AAA rated – hence safe for investment. Senior Citizens Saving Scheme offers 8.3% interest which is payable quarterly. This too is backed by Government of India and so is safe. The problem is you can lock-in your amount only for 5 years. DHFL is housing finance company and is rated AAA. It offers 8.45% to senior citizens for fixed deposit up to 10 years. You can choose to get interest monthly, quarterly, half-yearly or yearly. Regular income can be generated by investing and then using SWP (Systematic Withdrawal Plan) to generate regular income. This is usually more tax efficient than fixed deposits. Also the returns are closer to bank fixed deposits. Read: How SWP in Debt Mutual Funds is better than Fixed Deposit for Regular Income? 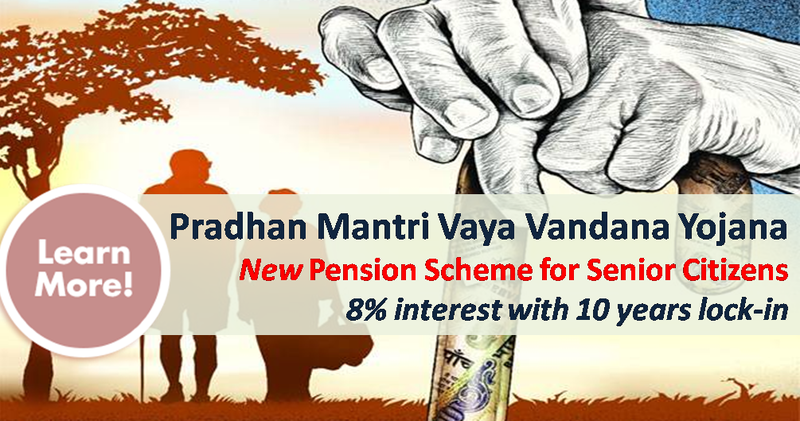 I think Pradhan Mantri Vaya Vandana Yojana (PMVVY) is a good and simple product especially for aged people looking for regular income after retirement. But there are other investments as listed above which offer more returns. You must evaluate those before locking your money in the pension plan. प्रधान मंत्री वय वंदना योजना में 8% मिलने वाली ब्याज पूर्णतः taxable है जिनकी आय 20% की स्लैब में है उनको प्राप्त होने वाली ब्याज 7% से काफी कम पड़ेगी. 10 वर्षो बाद जब जमा धन वापस मिलेगा तो उसकी मार्केट वैल्यू काफी कम हो चुकी होगी अतः PMVVY से मिलने वाली ब्याज को लगातार NSC में जमा करते रहें.